Last November was my grandma's 80th birthday. "No birthday party for me!" she warned her children (my parents, my uncles, and my aunties) as they usually make a (surprise) birthday party for her. 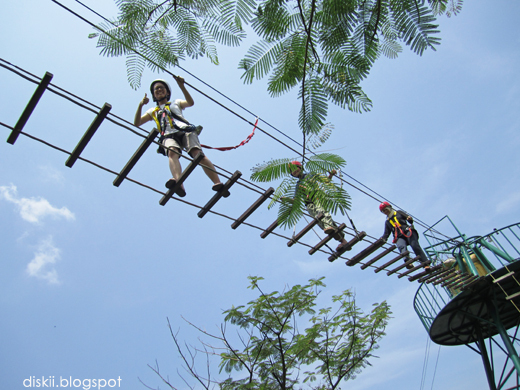 In order to replace the annual party, they arranged a weekend trip to Bogor. We stayed at place named Aldepos Salaca. 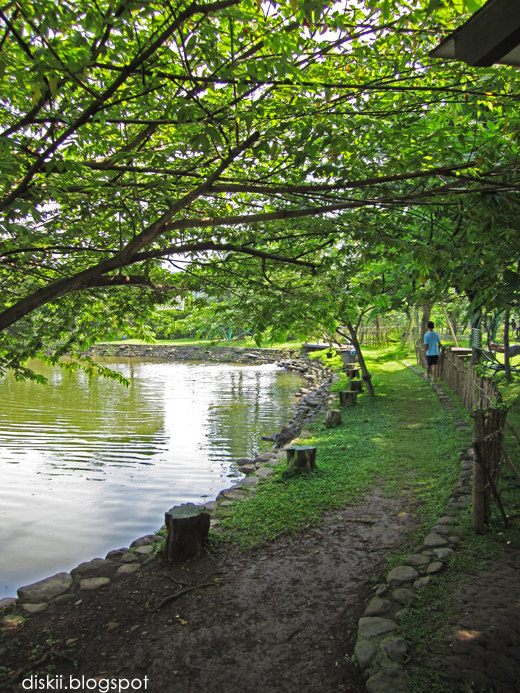 It is located in Tenjolaya, Bogor, near Institut Pertanian Bogor. For someone who needs some quiet environment to relax this place is very suitable. The place is huge (about 60 hectares) with only eight villas inside. The villas are surrounded by many plantations. It was so refreshing to see green everywhere. 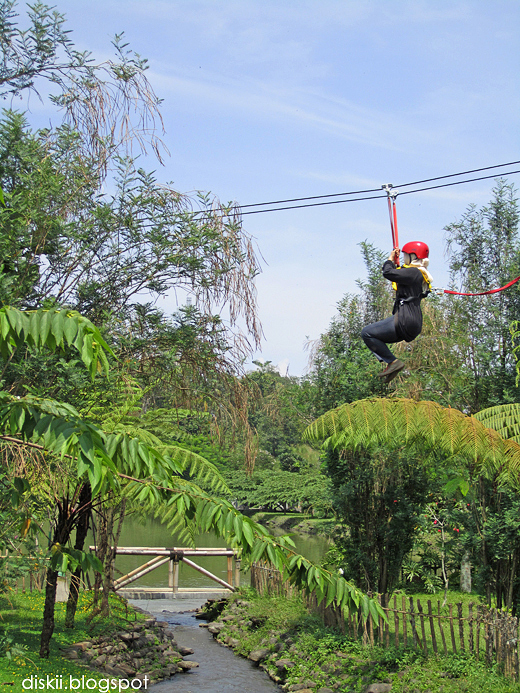 As a complimentary we can try flying fox. 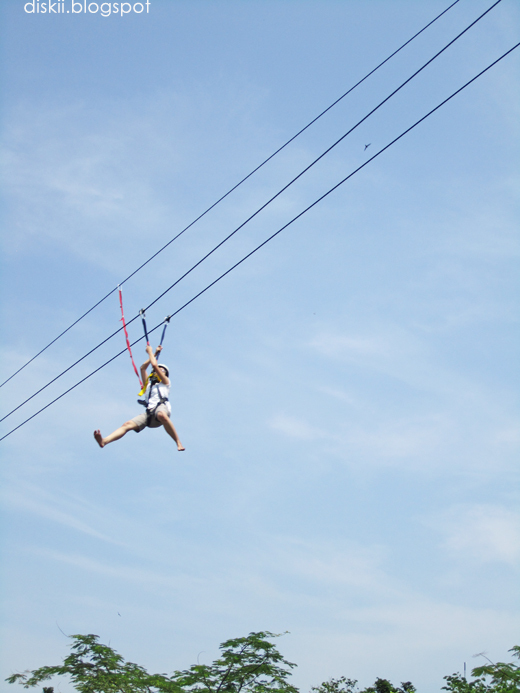 I did not have a gut to try, because it was quite high and I really don't like the sensation of hanging. So I volunteered myself to take pictures. Here are some pictures that I took. 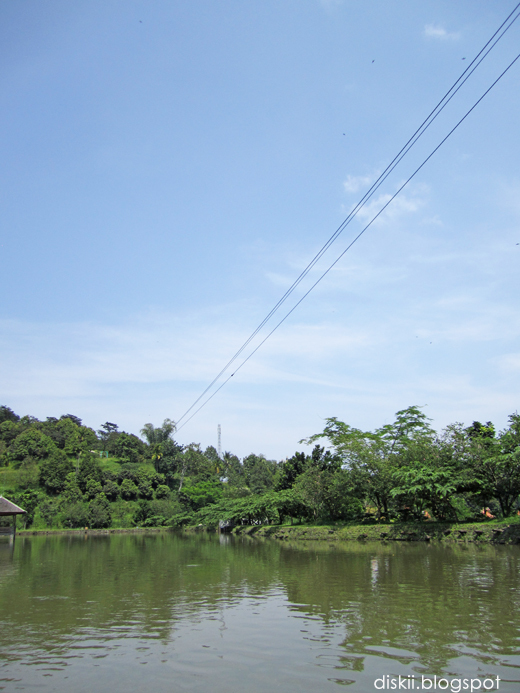 Beside flying fox there were some activities that we can try, such as fishing, making pottery, washing buffaloes, barbecue or doing some free stuffs like swimming, jogging, or playing in the river. For pottery class, because the pottery that you make needs to be burned and colored, you can have the result about two weeks later. 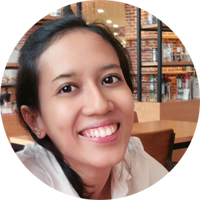 You can take it in Pondok Indah, Jakarta or you can ask them to send it to your home. The only thing that was lack from this place was cool weather. Cool weather never failed to make me happy and refresh. Here, I couldn't feel like I was in the mountain. Oh, I also think paying for washing the buffaloes is stupid. Hehe. - Rorompog Sagi Tilu (Triangle House) is the most unique villas in here. Worth to try. - For more info about this place you can visit the official sites here. Btw I am not paid to write this post. Hehe. Label: Akhir pekan, Bogor, Bogor Trip, English, Jalan-jalan ke Bogor, Travel. Keep travelling, have fun and don't stop blogging about it! Hello Marko! Thank you for the vote. I saw your post, your activity seems more challenging than mine. Btw good luck with the competition!